The 13th edition of the Volvo Ocean Race 2017-18 came to an epic climax in the Hague in June, with three boats bearing down on the finishing line carrying equal points. From the point of view of the skippers and sailors it was a nerve-shredding nail biter of a leg; from the media angle, and public engagement, it just couldn’t get any better. Starting in 1973 as the Whitbread Round the World Race, the only fully-crewed circumnavigating yacht race in the world has acquired a reputation second to none. It’s long, it’s tough, and it’s both mentally and physically exhausting. The race track passes four of the five “Great Capes” – Agulhas, Leeuwin, South East Cape and Cape Horn, and crossed the Equator four times – it is cooking hot at the Equator, and bitterly cold in the Southern Ocean. The powerful weather systems of the Roaring Forties and the Furious Fifties test the world’s very best offshore sailors to their absolute limits. They call it “Life at the Extreme”, and this time it all came down to a matter of three miles at the finish line. The Volvo Ocean Race is sailed in VOR65 class one-design boats, meaning that every boat is the same. Absolutely the same. Same gear, same sails, same weight, same everything – meaning that the only difference is between the sailors. This year, and in order to encourage a greater diversity within crews, teams were required to include crew members under 30 years of age, and encouraged the inclusion of women on the roster. After a warm-up leg from Alicante to Lisbon, the race blasted south down the Atlantic to Capetown before heading into the Southern Ocean en route to a Christmas in Melbourne. On the way to Hong Kong, Team Sun Hung Kai Scallywag lost (and recovered) a man overboard, and then romped into her adopted home port at the front of the fleet. repairs in advance of the next leg. After Auckland, the boats raced through the Southern Ocean once more, when Team Sun Hung Kai Scallywag lost another sailor, John Fisher, overboard on the approach to Cape Horn. This time there was no recovery, and Scallywag retired from the race to Itajaí. Overall race leader MAPFRE damaged her mast and then split her mainsail, necessitating emergency repairs in a quiet bay near Cape Horn of all places! Vestas 11th Hour Racing was unmasted and limped into Port Stanley in the Falkland Islands in order to fix up a jury rig which allowed her to get to Itajaí just in time to fit a new mast and start the next race – to Newport. MAPFRE drifted to a foggy win in Newport, passing her immediate competitors in the closing metres of the race (literally), but for Team Brunel in second place it was the start of a great comeback under the leadership of skipper Bouwe Bekking, who has competed in the VOR seven times without ever managing to win, having had an undistinguished first half of the trip around the world. Across the Atlantic to Cardiff, weather conditions stacked up to a perfect sailing angle, and several boats broke the VOR 24- hour record. 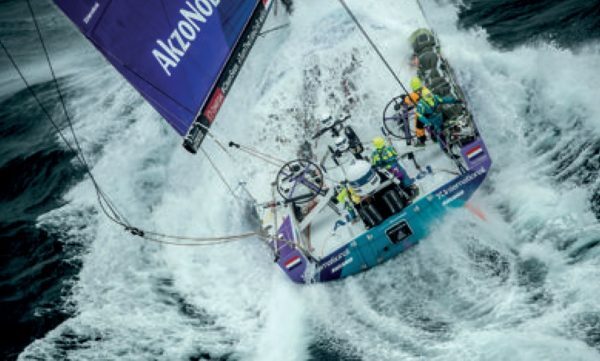 AkzoNobel went one better and set a new 24-hour monohull record distance of 602.54nm at an average speed of 25.10kts. Astounding. Team Brunel, first. From Cardiff to Gothenburg, with Ireland to starboard, the North Sea was “the Southern Ocean all over again,” and earned Brunel another win. With just the final leg remaining from Gothenburg to The Hague, three boats were now tied on equal points: Dongfeng Racing, MAPFRE and Team Brunel. The finishing order of those boats would determine the finishing order for the race overall. Brunel and MAPFRE had won three of the races up to this point, and Dongfeng had never seen better than a second place. The closing miles of the race track demanded a crucial tactical decision: whether to stay close to the coast and hope for a better wind angle, or stay further offshore in the anticipation of stronger breeze. 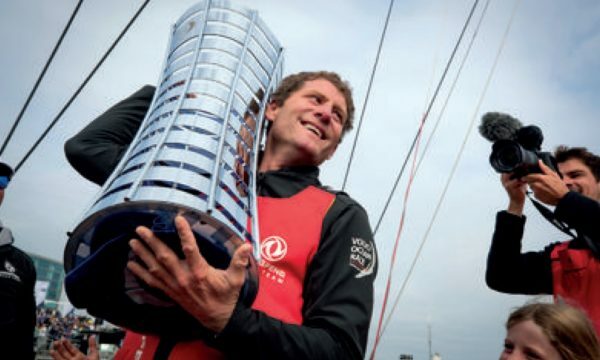 In the closing miles of the longest crewed sailing race in the world, Dongfeng Racing Team under the command of Frenchman Charles Caudrelier, took the inshore route and crept into a three-mile lead over their immediate competitors. If there was ever a “best” time to win a leg, this was it. And now it’s all over bar the shouting, although after such a close finish, the shouting will go on for some time and rightly so. 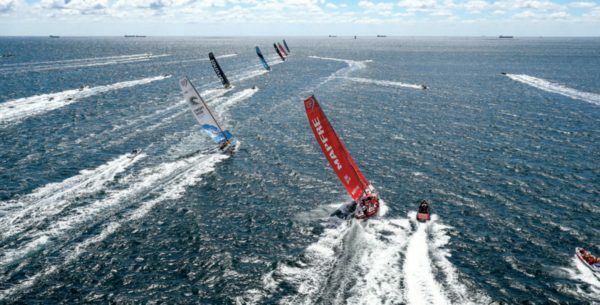 Through the usage of drone photography and the “extreme” media skills of the race’s OnBoard Reporters (heroes, every one of them), the 2017-18 Volvo Ocean Race brought the superhuman efforts of the sailing crews and the spectacle of ocean racing closer than ever before to the general public. It is engagement at the very highest level.